Fried Bananas recipe by bestchefs at DesiRecipes.com. Mix the flour, rice flour, cornflour, baking powder and salt with a cup of water into a smooth batter. 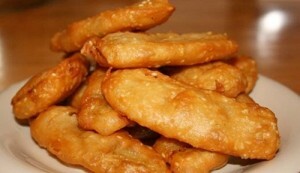 Dip the banana halves in the batter and deep fry in oil until golden brown. Drain on absorbent paper. Sprinkle with the brown sugar and serve immediately with vanilla or coconut ice-cream.